Arsenic and Old Mooncloth | Ramblings of a crazy girl gamer. I know, I know, most people reading this will have cleared Siege of Orgrimmar Flex ages ago, but to say the guild I am in started raiding MoP content a month and a half ago, I think we have the right to be proud that last night we cleared part 3 in one evening on our first night there. That’s Raiders-Inc posing proudly infront of one dead dinosaur! It was really good, we all worked hard, and whilst mistakes were made occasionally we bested the place. Just a shame I didn’t get any loot, even using extra loot rolls (damn you RNG!!!). So that’s the smooth, so on to the rough. It’s not game related. In May last year I started getting some weird pains in my back and shoulders, it felt like I was burning or being stabbed with tiny little needles, to the point where even wearing clothes caused major pain. Yet there wasn’t a mark on me. I was also having issues with being unable to concentrate, feeling like my brain was full of cotton wool and having sleeping problems. I went to the doctor, who referred me to a Rheumatology consultant at the local hospital, and after a few appointments this morning I have been officially diagnosed with Fibromyalgia. Not the best news in the world, but at least I’m not going crazy. It may cause me trouble in the future, but then who knows what the future would bring anyway? So I have been put on some medication called Pregabalin which will hopefully relieve the chronic pain in my back and shoulders. It’s not as bad as it was for a while last year, but it’s THERE, so if something can help me then I’ll be happy. ANyway, it’s onwards and upwards for me, I’m not letting this slow me down! In any game I have to say I can spend ages creating my characters, it amuses my husband no end. So yeah, getting the right ‘look’ for my character is important to me. Back when I first started playing WoW I was quite happy with the character models. I still don’t think they are bad, but lets face it, the lack of individual fingers and somewhat blocky outlines doesn’t look too good nowadays, especially when you compare it to the newer Pandaren models. But blizzard have decided to address this in the next expansion, and have slowly been releasing pictures of the updated models, and I am for the most part happy with them. 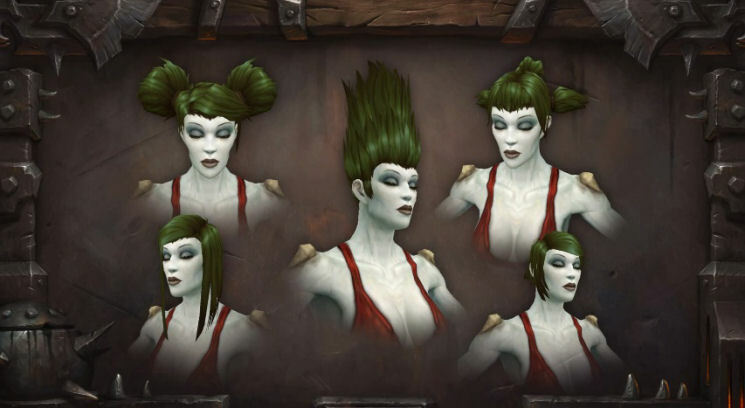 Now I’m not going into all the updated models (sorry), but I am going to talk about the female Undead and the female Human models. First off, the Undead. 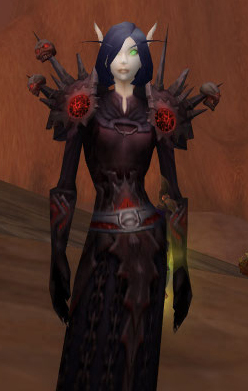 The first ‘real’ character I ever rolled was a female Undead Priest. I’d messed around with a few classes beforehand, but she was the first class I fell in love with. I got her to 60, which took a while in those days, and she was my main for about a year before I ended up jumping ship to the alliance side. I still have a soft spot for female Undead, but I don’t regularly play one. Why? Knees and Elbows. Personally I think the bony knees and elbows ruin the look of armour for the most part, and when I heard about the model revamp I really, REALLY hoped they’d do away with them. But alas, it’s not to be. Still no knees or elbows. But other than that it’s all ok, right? Weeeeeelllll… Yes, apart from one thing. They are too damn pretty. Of course this is just one example, so I’m hoping that there are going to be faces that are more rotted, and I would hope you can still have the option to have it look like you face is held together by leather straps. I’d say dead should be attractive, but that’s just how I feel about it. So on to the female Human model. Again, not bad. Much smoother, and I love the updated hair. Not sure about the body shape, but that’s always been one thing I haven’t liked about the WoW character creator is the total abscence of the ability to alter you body shape, height etc. It doesn’t make much sense to me that a warrior who would require a lot of physical training has the same body shape as a mage who sits and reads books all day. Plus if I want my character to be short and cuddly (and not be a female dwarf), then it’s kind of sad I can’t have her that way. Please tell me I’m not the only one who thinks that who the examples look like. 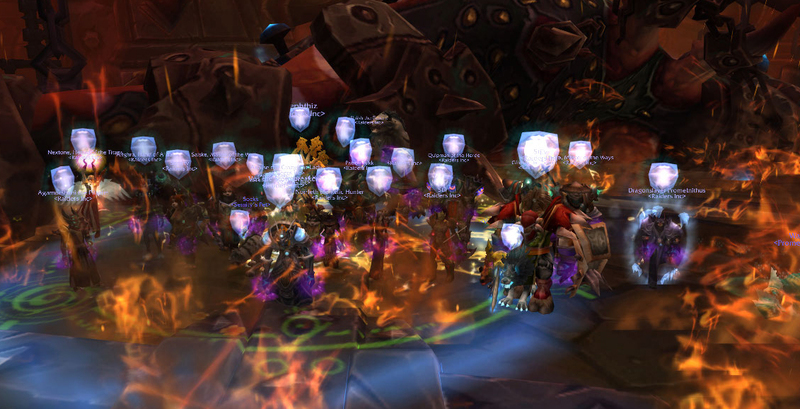 So tonight I was doing The Iron Juggernaut in LFR with Eldaraina. It gets to the second phase with the exploding tar and the Shock Pulse, and so I stand where I normally do, near the fence where you enter. I’ve done it this way many times, but this time the Shock Pulse knocked me over the fence and out of the combat area, where I promptly died. Seems no one in the raid had ever seen it happen before, which caused a bit of laughter. First time for everything I guess! So, I have been a bad blogger haven’t I? I’ve totally neglected this blog for nearly a year now. I have no real excuses other than I’ve been working a lot and my interest in the game waned somewhat. But I’m back, and whilst still busy, I’ve gotten a new interest in the game. This is my Blood Elf Warlock I decided to level back in November. I felt like a change, and my work nights totally coincided with my alliance guilds raid nights, so I rolled a baby ‘lock on Argent Dawn EU. Warlock is one of the classes I’ve not played much, and I was happily surprised how much fun I had with her. I managed to hit 90 with her literally the week before Blizzard finally made it so you could mail heirlooms cross realm, so levelling her was both fun yet oddly nerve wracking as every dungeon I ran was with mostly with people in full heirlooms, so I spent a lot of time worrying that I was doing something terribly wrong as I was rarely anywhere but the bottom of the dps tables. At least I could send Timeless Isle BoAs to her. And I found out I wasn’t so bad *phew*. I ended up joining a nice bunch of folks called Raiders Inc that haven’t been raiding MoP stuff very long, so I don’t feel like I’m lagging behind, and the game is fun again! So expect to hear more from me from now on! As for her Mog, that’s my favourite EVER tier gear, worth levelling a ‘lock for in itself. So it’s been a while huh? I’ve sadly neglected this blog, but I swear I’ll be more active from now on. There have been some big changes for me, both in real life and in game. So I’d better explain. I now work full time at the pub. Which is great, but for now at least I’m working Monday, Wednesday and Thursday evenings until close. As Enthusiams raiding nights are Monday, Thursday and Friday I had to make the hard decision to change to another guild, one that had raiding times more suited to my hours. So I am now a raiding member of Oops Wrong Button on Bronze Dragonflight EU. I’m also playing a Beast Mastery Hunter as my main now. I still have characters in Enthusiasm, and I will be dropping in to visit ALOT. I cried when I left, much to G’s bemusement, not being an online gamer like myself he didn’t quite get why I was upset. Another change in my life is me and G get married in May. So much to plan, when I think I’ve got it all sorted something else comes up, and I had a disaster with ordering my dress online (the ‘UK’ company turned out to be a Chinese shop selling knock offs of other people’s designs, they even stole photos for the original websites), but I got my money back in the end and its all back on track. G’s outfit cost more than mine! But I am geeking out to the max in one respect. I am turning up to my wedding in a DeLorean. 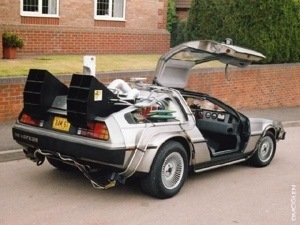 That’s the Back to the Future car for those who don’t know. Hey, what can I say, I have love those movies since I was a little kid! I’ve always wanted to ride in a DeLorean and now I am! Anyway, I am at work so better be getting on with things. I’ll be designing a new banner reflecting the new changes for my blog later. I was having a chat with some guildies recently, the subject being two guilds on our server. Is it just us, or do you find certain guilds on your server are filled with asshats? I mean everytime we have grouped with members of these two guilds (I won’t name either) they have turned out to be “GOGOGOGO”, stand in the bad and down right rude types, to the point where we groan whenever we encounter any of them. Then there is one member of one of the guilds that is my own personal bugbear. The guy always seems to be around whilst I am doing my dailies, and whenever someone has nipped in and taken the item I am fighting towards, it’s ALWAYS this guy. I’m not so paranoid as to think he is doing it on purpose, he isn’t there 100% of the time, but whenever he is around, it’s ninjatastic. So my question is this: Do only bad players join these types of guild as they are the only type that will tolerate their behaviour, or do these guilds transform good players. I realised today I forgot to blog about the fact I passed my driving test three weeks ago, first try! 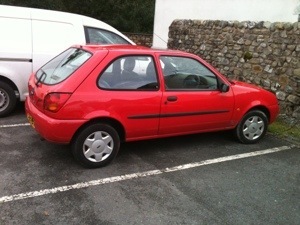 To celebrate Graham bought me a little red 1999 Ford Fiesta. It’s old, it’s done a lot of miles, but it’s mine! I’m still learning things too. Like how sneezing whilst going 50 mph is terrifying.